Bored Vicar or Political Commentary? Earlier this week I had come across a page of notes and drawings in the middle of the death register books forfor Ogeu les bains, France. The time period was the 1773-1773. These drawings and the ones on the page 10 years later are by the same person, Jospeh Lapenne of Ogeu (aka Ogeu les bains). The entry above it is a typical baptismal entry. Catherine and Raymond Lapenne were the godparents–perhaps relatives of our Monsieur Lapenne. There are math calculations on the page, the drawings, the reference to 1806, what looks like “Jesus Crist” on the right hand side. Was he doodling out of boredom? 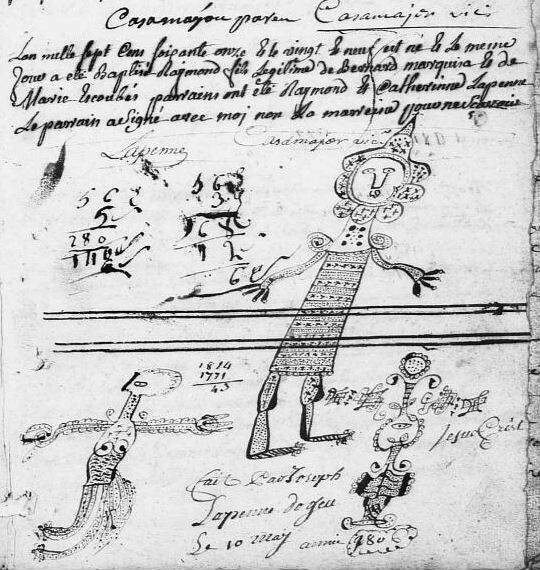 Do these drawings represent the LaPenne family in some way? Was he making some sort of political statement? I don’t supposed I’ll ever know. Just another one of those interesting things we find while doing research. WOW, great doodles! Have no clue as to what or why, but, they are priceless!